Ivy did a great job in the show ring, finishing her titles in double quick time. 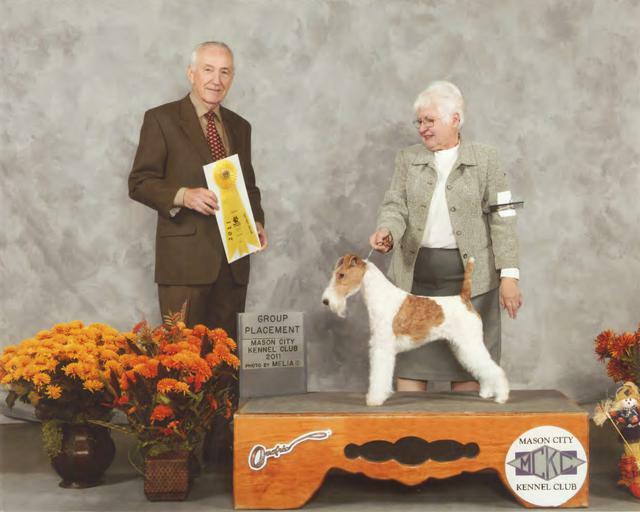 She also earned a group one and a group 3 in the process and of course, that new title, a "grand Champion". She is a small girl, but very pretty and very opinionated and not afraid to tell everyone her ideas. We are planning to breed her this spring but we have not settled on a daddy for her pups yet. 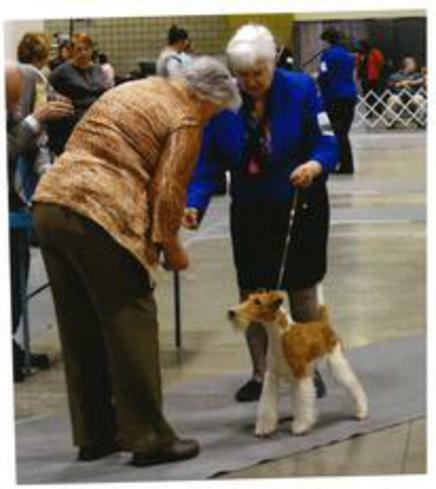 American Canadian, International Champion Briarlea's Tiger Lily. Tiger did very well in the show ring with Best in Show, Group Wins and Specialty Best of Breeds. 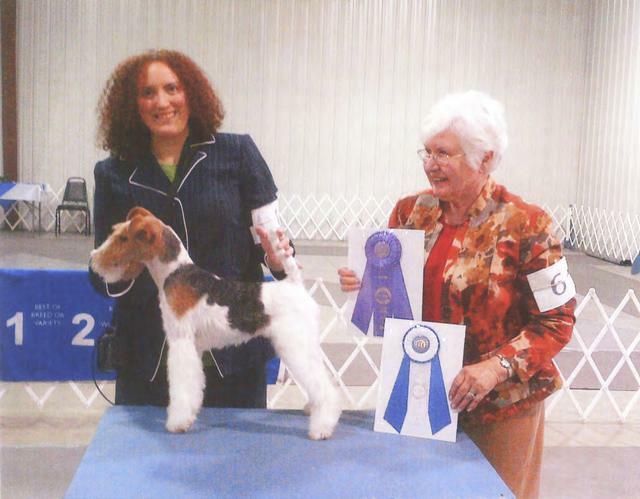 She was in the top five in the US in our breed and in the top three in Canadian Statistics. She also ended up on the cover of a new book on dog showing titled Dog Daze; Don't Forget the Liver by Linda Jenson. 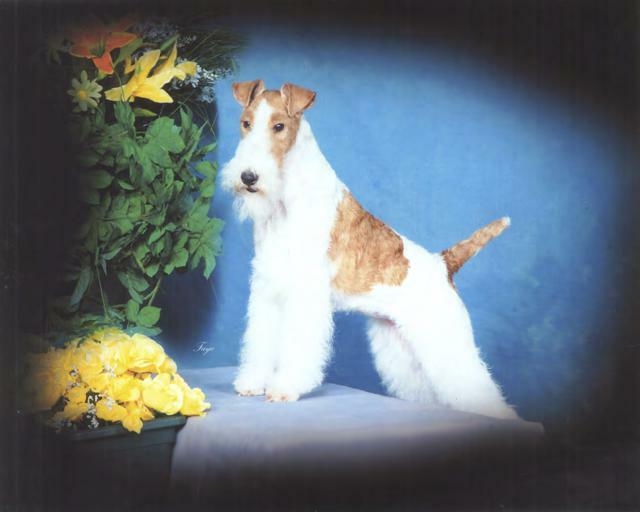 She is a ginger wire, and follows in her mother, American, Canadian Champion Briarlea's Forever Amber v Jelson, footsteps as far as personality is concerned. She does really take over the show ring. After a being a mom for a time, Tiger has been retired and is living with her new family in Duluth MN. Keaira is another ginger, and a full sister to Tiger Lily, with their parents being Briarlea's Forever Amber v Jelson and Champion Briarlea's Chasing the Wind. 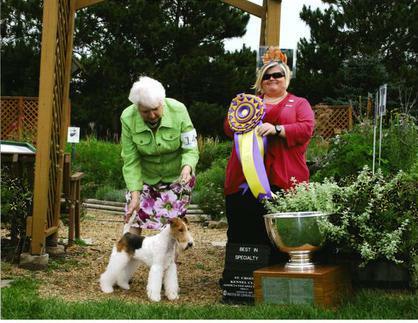 She also has had best in show wins, group placements and Specialty Best of Breed wins. However this little girl has a mind of her own and she decided she prefers obedience to the conformation show ring and after very little training she earned a Rally Title and an Obedience title. While she is very dominant in the conformation ring, she is very well behaved in obedience. As a result we have retired her from the show ring and will concentrate on the obedience work with time out for a litter or two of puppies. I am thinking it might be fun to have some letters after her name. This lovely little girl goes by the call name of Pink and has already accomplished great things in the ring, including group placements always handled by her co-owner Jesy Wahlsten. Pink lives with Jesy and her mother Joan Eastman and a few Cairn Terriers. Right now, she is busy learning a little obedience and helping Jesy to show those Cairn Terriers just who is in charge at that household. Jesy plans to put a few performance titles on Pink. Having been born on Halloween, Asia definitely fit her registered name . She took over our house and hearts and still lives at Briarlea as does a puppy from her first litter. That one is a little boy who earned the name Little Dickens in a very short while. A daughter has been sold to a show home and we hope to hear good news about her. We will be breeding her again but have not chosen a suitable sire. 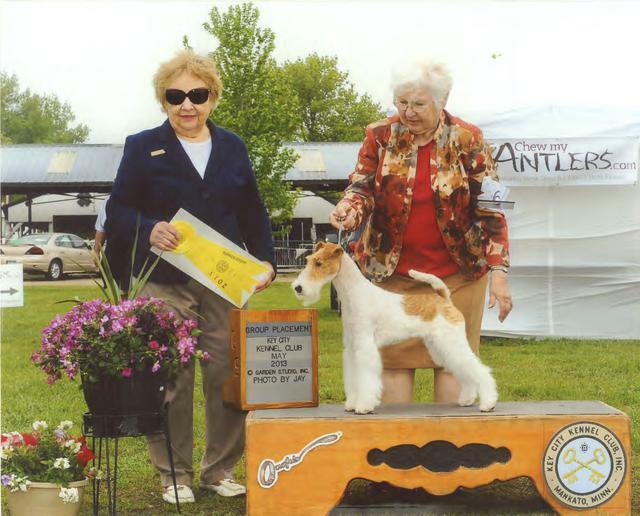 Asia did very well in the show ring and am along with her many wins is that of Best of Breed at the Greater Twin Cities Fox Terrier Specialty. Merida is a daughter of Ch. Tiger lily who is pictured above. She is a determined wire girl and very early decided that her vocation in life was that of a Service dog. she began by taking care of her owners and is still keeping an eye on us to be sure we do not do anything really stupid. She was shown and did some very nice winning but her heart was at home taking care of everything. We can be sure that after a day of shopping, she will be looking out the window waiting for us to come home. Her favorite time of theday is at bedtime when she jumps on our bed for a few minutes of stroking and petting.l She also is the only dog in a40 some years that has moved her bed to the foot of our bed and when there is a really bad storm, she jumps in with us. I am not sure if she is frightened or if she is protecting us from the bad thunder and lightening.